Can I replace the video in my Cinemagraph Pro document? To create a new document in Cinemagraph Pro for macOS, you can drag and drop a video into the welcome window or select Browse. A new document may also be created under the File menu or using the keyboard shortcut ⌘N (Command-N). Masking will determine which areas of your cinemagraph are in motion. Some masks will be very simple to apply while others will take time and experimentation to perfect. Another step in the creation process which can take more time and experimentation than others is setting your adjustments. Every so often, you may find yourself in a situation where you're midway through the creation process and want to make changes to your source video. Changes may include various adjustments using the video editing application of your choice or even selecting a different video clip you recorded during the same shoot. Instead of creating a new document from the beginning, you can simply replace your source video while maintaining all other edits you've saved in Cinemagraph Pro. Note: You can also replace the still image by removing the file masterFrame.png from your package contents and renaming your new still image in the same format. If you want to replace your video or image file from a cinemagraph created in Cinemagraph Pro for iOS, select Share Document on export. 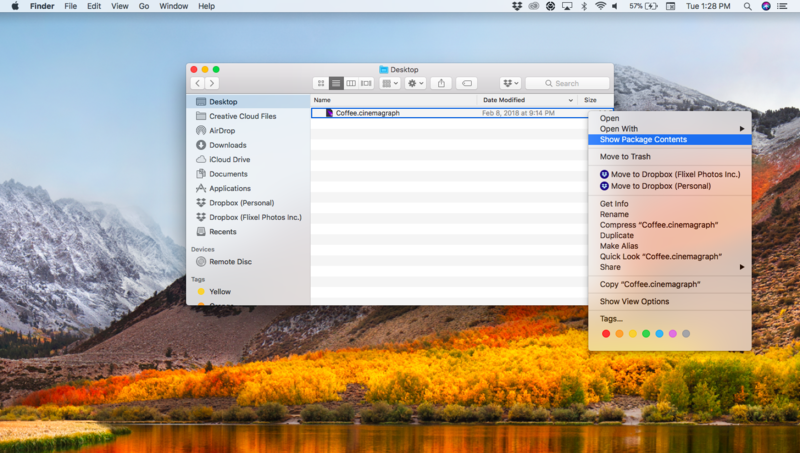 Then use Airdrop or another file transfer service to send the document to your Mac. After replacing the video or image file, you can send the document back to your iOS device to continue editing.